Aphasia is an acquired language disorder affecting the ability to communicate. It is usually acquired due to stroke or other brain injury, which impairs the ability to use and/or comprehend words. Damage to any segment of the large and complex neurocognitive network, usually located in the dominant hemisphere, can produce aphasia. Aphasia not only affects verbal communication but also written communication, such as disorders of reading (alexia) and or writing (agraphia). Disorders of learned skilled movement (apraxia), disorders of ability to calculate (acalculia), and disorders of recognition (agnosia), frequently tested as part of cognitive ability, are not a part of language problem. Broca’s area consists of Brodmann’s area 44 and 45, which are located in the posterior inferior frontal gyrus in the dominant hemisphere adjacent to the motor strip, and responsible for the output of the spoken language. Wernicke’s area has Brodmann’s area 22, located in the posterior superior portion of the temporal gyrus in the dominant hemisphere adjacent to the auditory center, and is responsible for comprehension. Complex associated cortical centers in between the two speech centers relay the message. Advanced imaging technology has enabled a challenge to the concept that damage to the arcuate fasciculus connecting the two centers is responsible for the conductive aphasia. Areas surrounding the primary speech areas including the superior temporal gyrus, supplementary motor and sensory areas, as well as cortical symmetrical areas of the non-dominant hemisphere are also responsible for language development. Even though aphasia is a cortical phenomenon, subcortical (thalamus and basal ganglia) and cerebellar lesions may produce aphasic symptoms due to cortical hypoperfusion. Cerebral dominance could provide guidance for localization. One observational study indicated that 91% of right-handers and 60%-70% of left-handers have a predominant left hemisphere. Language disturbances due to right cerebral hemispheric lesions in right-handed individuals are often labeled as ‘crossed aphasia’. Aphasia cannot be assessed fully in the presence of altered consciousness. Delirium may sometimes mimic the presentation of aphasia and should be identified by the proper assessment of mental status. Careful mental status examination including level of consciousness, attention, memory, and executive functions are required since language evaluation can be affected by level of consciousness and vice versa. Major depression can also present as communication problems and can be identified by assessment of affect, mood, eye contact, and presence of withdrawal symptoms. The characteristic speech in a patient with aphasia caused by a stroke can be similar to the speech in some patients with schizophrenia or other psychotic disorders, especially similarities between schizophrenic agrammatism and semantic aphasia. Aphasia can be differentiated by pattern recognition and associated symptoms. Aphasia with comprehension is usually associated with depression; fluent aphasia without neurological deficit is sometimes mistakenly diagnosed as psychiatric illness. Dysarthria due to weakness in the muscles of articulation can be easily be mistaken for aphasia. It can be sub-classified as facial, lingual, laryngeal, and cerebellar and also can be classified as flaccid and spastic type. Other conditions such as toxic-metabolic encephalopathy, post-ictal state, brain stem ischemia, mutism, and sleep disorders can also mimic aphasia and should be excluded. Dysphonia is a problem in phonation due to pathology of the vocal cord region. It may easily be distinguished from aphasia since it has well preserved components of speech. Careful step-by-step speech evaluation maneuvers are likely to be useful in diagnosing aphasia, differentiating their subclasses (see below) and overall prognosis. Naming objects is a useful screen for aphasia because it is present in different forms and shapes. Wernicke’s aphasic patient may provide totally irrelevant answers. Fluency is determined by output, volume, effort and melody. Non-fluent aphasia – characterized by sparse, labored speech with pauses; word content per sentence is less than five. Fluent aphasia – patients have effortless and spontaneous speech with lots of paraphrasia and lack of circumstantiality (cannot make any sensible conclusion in the end), that sometimes mimic a psychiatric illness. Simple commands – for example, “open your mouth”. Complex commands – for example, “raise your left hand”, challenge patient comprehension of left to right discrimination. Two-step commands – for example, “raise your left hand and touch your right ear”, not only demand comprehension but also assess crossing the midline for any lateralization and hemineglect. Requesting the patients to repeat a simple phrase, (for example, “today is a fine day”) or a complex string of words (for example, “no ifs, ands or buts”). Tongue twisters such as “British constitution” can be used to assess dysarthria. It must be noted here that the processing of written and spoken language share the same semantic levels of representation, but that access to these semantic representations from written visual input uses a specific network involving the left posterior inferior temporal gyrus (fusiform gyrus) and the left supramarginal gyrus. Reading comprehension can be assessed by asking the patient to follow a written command (for example “close your eyes”) and writing comprehension can be assessed by asking the patient to write a simple sentence. Dissociation between auditory perception and auditory language processing are not uncommon. Reading comprehension may be preserved in Broca’s aphasia, transcortical motor aphasia and conduction aphasia. Aphasia can be an isolated event but is mostly associated with signs and symptoms of other middle cerebral artery territory of the dominant hemisphere such as hemiparesis, hemineglect, visual field defect, conjugate eye deviation, or gaze preference. Motor weakness is associated with non-fluent aphasia but sometimes weakness may be very subtle such as a mild decrease in nasolabial fold, pronator drift or asymmetry of reflexes. Presence of cerebellar signs such as dysarthria, titubation and dysdiadochokinesia can help to localize rare forms of aphasia due to cerebellar pathology. Fluent aphasia is usually free of neurological deficit except homonymous hemi- or quadrantanopia. Identification of cortical sensation such as stereognosis, graphesthesia, two-point discrimination, and sensory inattention may be useful to detect sensory associated speech area pathology. Computed tomography (CT) scan without contrast is the image of choice because of wide availability, and the need to perform it rapidly in order to facilitate thrombolytic therapy when indicated. Absence of a hemorrhagic lesion, gross mass effect or a large wedge shaped hypodense lesion, as evidence of infarction are easier to visualize. However, appreciating subtle effacement with loss of gray-white differentiation requires experience. It is worthwhile to repeat the CT scan if clinically indicated because significant lesions may not be immediately manifested. Magnetic resonance imaging (MRI) may be requested with flare, without or with gadolinium enhancement based on the clinical picture and CT findings. Diffusion weighted MRI (DW-MRI) is sensitive in detecting early ischemic changes. Perfusion weighted MRI (PW-MRI) would demonstrate the area of low perfusion. DW-MRI/PW-MRI mismatch would identify potentially salvageable surrounding penumbra. Routine laboratory studies including complete blood count (CBC), complete metabolic profile (CMP) and serum osmolarity are useful to optimize the clinical status, especially serum sodium and random blood glucose level. Continuous telemetry monitoring, transthoracic echocardiography (TTE) and carotid studies are routinely indicated to look for the possible etiology of a stroke. However, TEE should be reserved for patients in whom the etiology cannot be explained by routine testing. Evaluation for a hypercoagulopathy state should be probed for selective populations such as younger age (less than 45 years old), strong family history of hypercoagulopathy and history indicative of antiphospholipid antibody (for example, history of miscarriages). Electroencephalogram (EEG) has limited value in evaluating aphasia due to poor sensitivity and specificity. However, rare cases of Landau-Kleffner syndrome (LKS) or acquired epileptiform aphasia and frontal lobe non-convulsive aphasia have been reported. Aphasia is a clinical diagnosis. The spectrum of aphasia ranges from subtle anomia to extensive global aphasia (Figure 1). Early recognition, understanding of the time window for thrombolytic therapy and activation of a stroke team are crucial steps in management. Reducing door-to-needle time is always a challenge for the emergency response team and several measures have been put in place to improve teamwork including the “stroke code”. Management of aphasia requires addressing the underlying etiology. Partial or complete resolution of aphasia may be observed in patients with stroke and post trauma. Therapy with a speech and language pathologist can be tailored to the needs of the individual and family. Intensive aphasia therapy over a short period of time provides greater gains than less intensive therapy over longer periods. 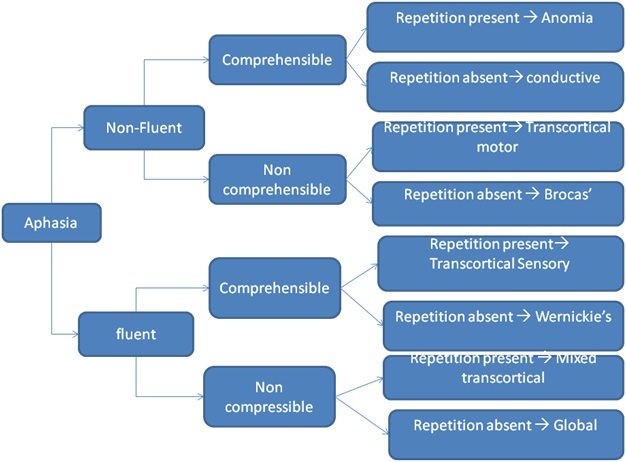 Constraint-induced aphasia therapy (CIAT) is a systematic constraint of verbal and nonverbal communication modalities with massed practice of targeted language skills. Current evidence provides that CIAT is superior to conventional speech and language therapy. Several pharmacotherapeutic approaches, which are designed to improve cognitive function, have been used in combination with speech therapy. The rationale for pharmacotherapy for post stroke aphasia is to improve attention span and enhance learning and memory and to improve the neuron-protective effect on the surrounding ischemic penumbra. The human brain has several major neurotransmitter pathways including cholinergic, dopaminergic, noradrenergic, serotonergic, and glutaminate and gamma aminobutyric acid (GABA) pathways. Interruptions of any single or combination of such pathways result in language impairments. A list of drugs well studied and proven to be beneficial if used in conjunction with speech and language therapy is shown in Figure 2. The use of non-invasive brain stimulation techniques such as transcranial magnetic stimulation (TMS) and transcranial direct current stimulation (tDCS) over the lesion and contralateral regions has been studied. Increased accuracy and fluency has been reported in early studies, however large randomized studies are required for their implication in current practice. Aphasia is a clinical diagnosis confirmed by neuron-diagnostic imaging. Early recognition and effective utilization of revascularization therapy would limit the damage and improve outcome in post stroke aphasia. CIAT along with supportive care and selective pharmacotherapy has improved the outcome. Del Zoppo, GJ, Saver, JL, Jauch, EC. “Expansion of the time window for treatment of acute ischemic stroke with intravenous tissue plasminogen activator. A science advisory from the American Heart Association/American Stroke Association”. . May 28, 2009. Greener, J, Enderby, P, Whurr, R. “Pharmacological treatment for aphasia following stroke”. . 2001. Kertesz, A, McCabe, P. “Recovery pattern and prognosis of aphasia”. . vol. 100. Mar 1977. pp. 1-18. Marcelo, L. “Drug therapy of Post-Stroke Aphasia; A review of Current Evidence”. . vol. 21. 2011. pp. 302-317.